I finished up with the wiper motor and mechanism check/overhaul this evening. Then it was all popped back together and I put the kettle on. I will also take the opportunity to rub down and paint the linkage while it is off the car - but that's a job for another day. Rubbed down the wiper linkage parts and the motor housing when I got home from Archery. Hopefully I can get some paint on everything some time tomorrow. When I had my mk4 Astra, I had to replace the whole wiper assembly due to the lack of lubricant as there were several mm's of wear on the wiper spindles! Manta/Cavalier one's must be made of tougher stuff! Many thanks Exclusive Opel, that is very helpful. I am going to follow that guide this morning, before I slap some paint on everything. Thanks to Exclusive Opels excellent guide, the spindles have now been separated, cleaned, lubricated and reassembled. Following that, I applied some paint. I will post up some photos later when the paint has dried enough for me to handle it. Everything back together and a little bit of paint added to spruce things up a little. 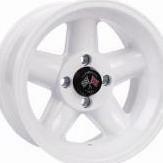 I thought I would do most of it in White Hammerite to match the servo and master cylinder. Tomorrow I will have a tidy up in the engine bay where is needs to sit. Currently its full of muck, leaves and cobwebs etc - urrggh! Note! the linkage to motor spindle retaining nut is only on by a thread or two so I can drop it down a bit to aid reassembly and final positioning of the arms. Just cleaned up the engine bay/under bonnet area where the wiper linkage and motor sits. After pottering about with the wipers over the last couple of days, I needed to refocus and get back to the bodywork. With a couple of minor 'corrections' done on the OS it was time to get back to the 'wobbly' boot lip again. After some elbow grease its starting to come around. Plenty more to do though over the next few evenings. As you can probably see from the photo above, the bottom edge of the lip needs levelling out. This is a little easier said than done as you need to try to find a reference point, then plot it across the whole panel. Fortunately I was able to cobble together a combination of woodwork tools to do that and now I have a line to work to during the week ahead. That should make the whole job a bit easier! A bit more work done on the boot lid this evening, its slowly but surely coming around. As you can see, there a few little 'nibbles' along the very bottom edge that need to be addressed next. When you look at the boot lid from the back of the car with the rear screen missing it actually looks massive - weird really. Applied some stopper filler this evening to allow me to sort out the final little defects. 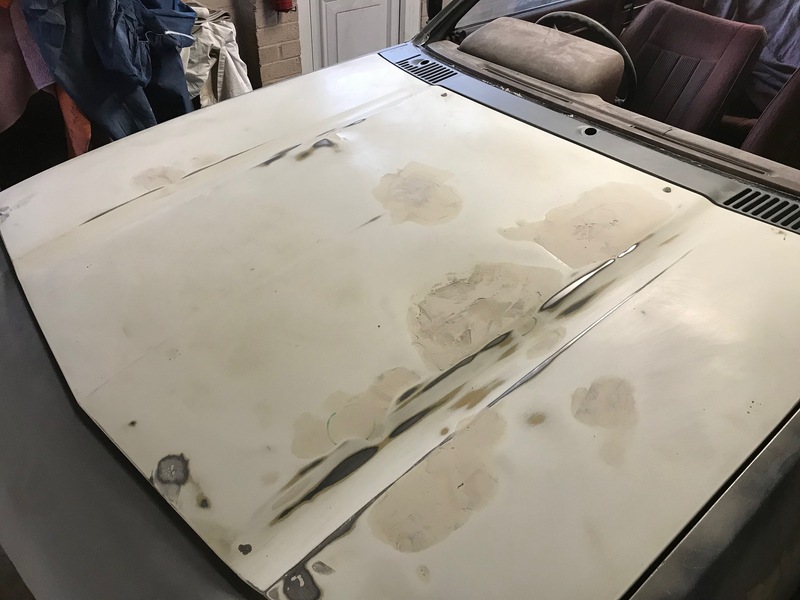 After that is sanded down over the next couple of days, two or three decent coats of primer will follow then we can move on to the next panel. Does look well now, especially when you think that a lot of people would have given up on that boot lid. Lol, yes indeed - it did cross my mind too on more than one occasion I can tell you. That will be dry later, so hopefully some 600-800 grit over the top and some more primer will have that finished off tomorrow. This means that I dont have to move lord knows how many cars around on the drive just to spin the Cav 180 in the garage. It should also provide a little more motivation knowing that when I do spin it around, this very large panel is also done and only the NS front wing, door and rear quarter will be left to do before a respray. Some good progress this morning. The boot lid is now in its final shape, which is very pleasing after so much mucking around with it. It seemed like every time I though I had it cracked I noticed another little place to attack. This time of year everything takes so long to dry/go off, so I had to wait hours or until the next day before I could continue. Anyway... that's all in the past now and the first proper coat of primer has just go on - hooray! Another couple of coats and we can move on again. 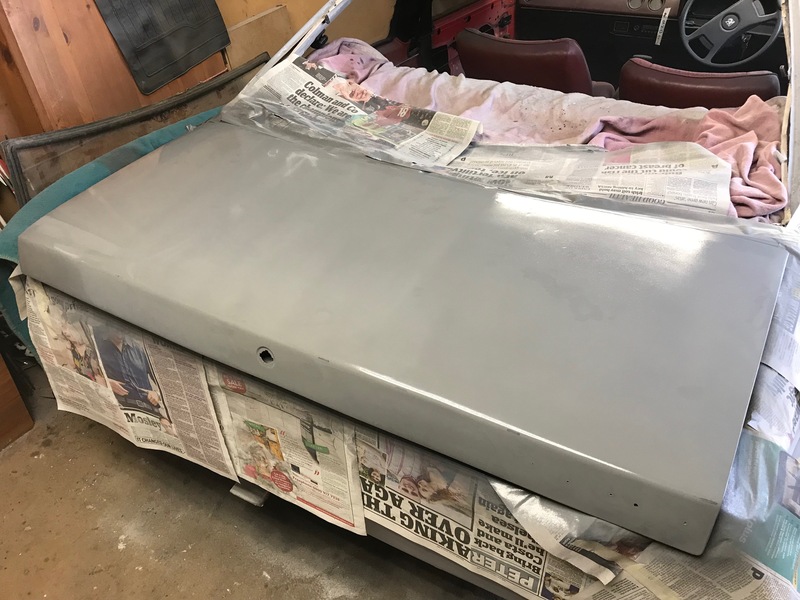 In anticipation of completing the boot lid (and before the primer went on), I dived back in to the bonnet and starting sanding back some of the lumps of filler I had been chucking on there. Basically I kept mixing up too much for the boot lid and needed somewhere worthwhile to put the excess. Seriously though, I always have my mobile 500w floodlight shining at what I am working on, there really is no escape from what you can see then. I’m hoping that is a blessing in disguise and the end result will be a decent top coat finish - fingers crossed! 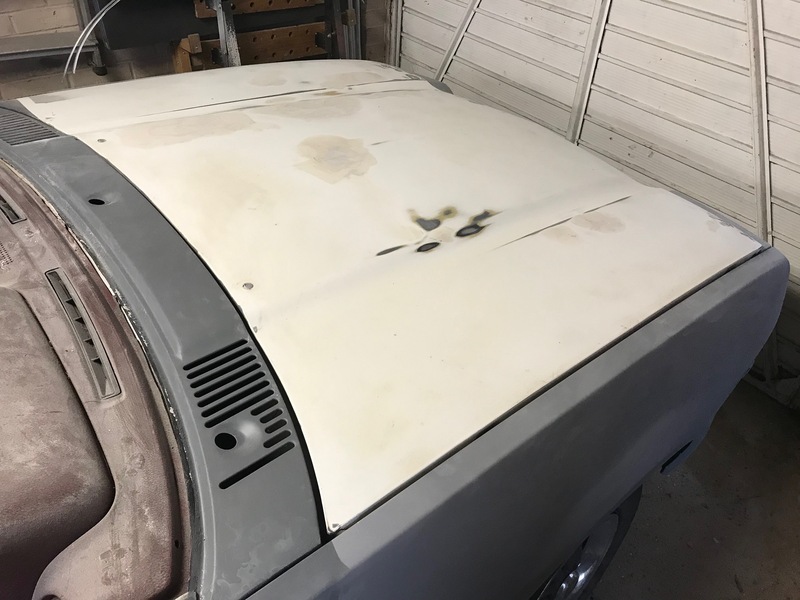 So, more sanding of the bonnet this morning to try to get some basic shape into it and to see which areas need more attention. Its one of those good news, bad news days really. The good news is that probably just over half of the areas are now a good shape and just in need of some finer sanding and away we go. The bad news is the 'low' spots are even lower and large than I thought. The black permanent marker circles show the worst parts, but as you will see, two are quite small areas, but one is huge. Not expland very well but if you look on Facebook or eBay you can find it .Dont know if it works. 1200bandit, Good shout, with that system you minimise the amount of filler required by pulling the steel as much as possible into its original position,then possibly hammer and dolly into final shape then finish off with a light skim of filler, seen Edd China use this method. Edited January 27 by Mike. Yes I have thanks, in fact I have one (mines a 'Dent King' if my memory serves me) ... My summary of those things is , great IF you can get the glue to hold - and it never does! Thanks for the suggestion though, much appreciated. I have tried to push the dents up from underneath, but sadly the Steel has lost its memory and it just 'pings' straight back down again. This evening I did a bit more sanding of the filler applied this morning and its going ok to be honest, apart from another low spot discovered close to the OS washer jet. Here is the bonnet with the next skim of filler applied. Just pulled the washer jets off the end of the feed pipes to make the sanding and painting job much easier. More fun with the sanding block this evening - BORRRINNNNG! Block sanding does warm you up quickly in a very cold garage though I can tell you! I did make some decent progress though, the big NS low point is all but sorted - it now has a good shape and just need stopper filler before final sanding and priming. The OS low point near the washer jet hole is a different story though, that still has a very long way to go. I will chuck some more mud on that tomorrow night.